There’s much to do when it comes to relaxing. You can lie down for a nap in your outdoor hammock, all the while enjoying the fresh air and sunlight. You can take a seat with a warm drink and a good book. Even a late night stroll will do. Out of all of these methods to relax, though, is arguably the best way to unwind. That is, to take a long, soothing bath. Let’s not ask why, but rather accept the fact that there’s something about a tub full of water that can really take the edge off of our day. Even better than a bath, though, is building upon the experience to make it even more relaxing. Perhaps you already know of a few, but there’s several ways through which you can make your typical bath even more relaxing. Just read on for the details. Let’s start from the very beginning; filling your bathtub up with water. Which temperature should you pick for the water to be at? Well, that all depends on you. You should adjust your water temperature according to whichever bathing experience you’re in the mood for. 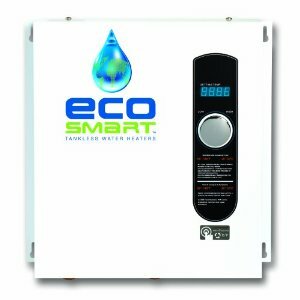 First, let us look at what experience hot water can provide for you. Hot water aids in the treatment of aches and pains and is also great for improving the blood circulation within the body. It also carries a calming effect on the body, providing a temporary relief from feelings of stress and tension. Cold water, on the other hand, can help in the healing process for bruises and other injuries. If you’re feeling particularly exhausted, a cold bath can quicken the removal of lactic acids from your muscles and also prevent swelling. It’s also refreshing, and can rejuvenate you for the rest of the day. The inclusion of oils is a great way to compliment the relaxing effect of a bath. You can add oils bought directly from the supermarket or even concoct your own mixtures at home. Either way, you’ll find that the addition of oils truly enhances your bathing experience. Lavender, eucalyptuses, coconut, and rose are all great for helping your tense muscles loosen up and relax. You can make use of lemon or rosemary after a rather hectic day to help get your mind at ease, and if your day was just overall stressful, then you may want to try out some clove oil or even some geranium. 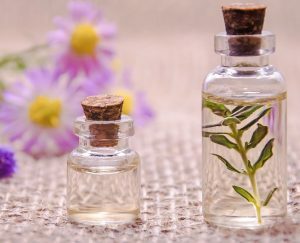 Choose according to your preference, and if you find that still is not enough, perhaps consider some Epsom salt to go along with your combination of oils. While bathing, you may want to bring something along to help keep yourself entertained. Your phone, a tablet, a magazine, a book – anything. Perhaps even a dish of your favourite meal or even a drink. Of course, you wouldn’t want to run the risk of your valuables falling into the water and being ruined. That’s why you bring along a tray. A standard tray for your bathtub is easy to come by, but you may find it difficult to find one suited for the dimensions of your bathtub. In such a case, you may as well make your own tray. Simply buy a wooden plank and any essential tools you may need to customise it from your local DIY centre, and there you have it. Your very own bath tray. 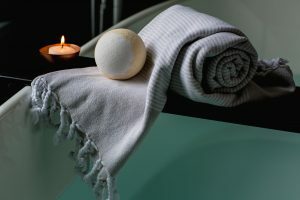 Another great item to bring with you to the tub is a soft fabric pillow. There’s no comfort to be gained by resting your head against the cold acrylic edge of your tub. So why not save yourself the trouble of an aching neck, and instead prop up a bathroom pillow by the end of your tub? It’s a sure way to relax. Atmosphere. That’s what you should keep in mind. Sometimes, the slightest modifications to your surroundings can really bring about a difference. Consider dimming the lights. The removal of any bright lights from your surroundings can truly go a long way in setting up a more relaxed environment. You may even want to completely turn off all lights and just light up a few scented candles. They help build a more aesthetic atmosphere, and also delight our senses with an enjoyable array of fragrances. Then, of course, is the issue of sound. Often, the best way to relax is to completely drown out any and all noises from our surroundings. You may want to consider a comfortable pair of ear muffs for this, preferably waterproof. But perhaps you do not find complete silence very comforting, and would rather enjoy some music. Also a great idea. Just bring along whichever sound system you may have, prop it up somewhere safe and away from water, and play whatever music you find comforting. Honestly, there’s no limitations to what you can do in order to make a more relaxing atmosphere for yourself and enjoy the best bathtub experience. There’s more ways to relax in a bathtub than just floating around in water. Try out some relaxation techniques to understand where I’m coming from. One such way is breathing exercises. Simply inhale through your nostrils, all the while keeping your eyes on the steady rise of your chest. Then, hold your breath for no more than a couple of seconds before slowly exhaling. It doesn’t seem like much, but repeating this exercise can prove to be a great way to help relieve tension. And that’s not all. There’s also several forms of meditation you can occupy yourself with in the bathtub to help bring your mind at ease. Some examples include guided imagery and mantra meditation. Oh, and don’t forget your cucumber slices and clay mask. They’re just two items, but they are a great way to soothe your senses and help you calm down. And hey, they are also great for skincare.